Explore the beauty of Manali on Manali Peak Expedition. A challenging trek/climb, Manali Peak expedition begins from Dhundi. On this trek, enjoy the adventure of cutting and running through dense Pine, Mapple, Oak and Silver Fir forest; view of highest mountains of Dhauladhar range; climbing on plateau of Beas Kund and summit bid of Shetidhar peak and Manali Peak. In this 10 day expedition, one is rewarded with the splendid view of snow clad mountain ranges and the beauty of unexploited nature. 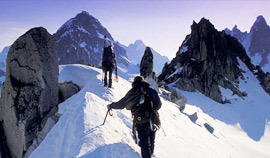 Since, it is a challenging climb, expect rope climbing and usage of other mountaineering equipments. Our journey will begin in the evening. We shall board AC Volvo Coach from Delhi to Manali. Overnight journey. We shall reach Manali in the morning and then will transfer to the hotel. In the afternoon, you will be met by our climbing expert, who will assist you about this expedition. We shall take a half day tour in the city today. Overnight stay at hotel. Today, we will drive to Dhundi, where we will be able to take a walk through the forest of Pine, Mapple, Walnut, Silver fir and Oak. West of Dhundi the highest mountain of the Dhauladhar (Hanuman Tibba 5950 m), on the east Deo Tibba 6001m, and Indra Asan 6100 m can be seen if the sky is clear. Bakkar Thach is a high altitude shepherd fields. Overnight in tents. 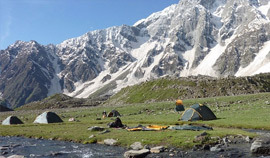 In the morning we will go for a short climb up to the ridge and then to the plateau of Beas Kund. 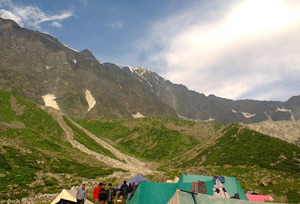 Camping in Beas Kund depends on good weather. Packed lunch will be served as the day will be dedicated to a full day excursion in Beas Kund plateau. Overnight in tents. Today, we will trek from Beas Kund to Camp, which takes about 6-7 hours. It is a steep uphill walk and is rewarded by the scenic views. Overnight in tents. We will be climbing to Camp 2 from Camp 1, which is likely to take about 5-6 hours. This climb requires technical skills along with all the climbing gears. It takes 30 minutes walk to reach the Shetidhar peak and about 3-4hrs to reach Manali Peak from Col Camp2. Overnight in tents. We begin our day with attempting summit. We shall climb the fix rope today. Our hard work will be rewarded by the breathtaking view of Dhauladhar and Pirpanjal range with Indrasan peak (6160mts) and Deotibba Peak (6001mts). After the summit, we will get back to Camp1.Overnight stay in tents. Today, after the breakfast, we shall trek to Bakkar Thach. Overnight stay in the tent. After breakfast we will head towards the Solang Nala via Dundi. Return to Manali. Overnight stay in the hotel. Today we shall devote half day for the local sightseeing at Manali. In the evening, we will drive to Delhi by AC Volvo coach. Overnight journey to Delhi.